If you were watching the debates, you might have also been on twitter. Coming off the debates, I've kind of felt like I've needed a detox. One of the things that was most surprising about being on twitter during the debates was that despite the fact that people talk about their disdain for partisan politics, twitter seemed mighty partisan last night. Sure there was the jokes about "binders of women." But it seems pretty clear that there are very few undecided voters. although those undecided voters continue to be mentioned as the ones to decide the election. 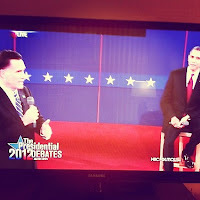 People seem to praise the politicians for their aggressiveness in debates, and both President Obama and Governor Romney got the memo and the town hall more seemed like a boxing match at times. Although, I struggle with this aggregation being the solution for America. I wonder what it would be like if Romney and Obama engaged in Lincoln-Douglas debates. Instead of two minute response times, they would have to fill much more space (the original format is 60 minutes for the first speaker, 90 for the second, and a 30 minute rejoinder by the first speaker). Neither candidate tried to answer the questions, instead they pivoted to their pre-planned talking points. And in the end, neither candidate seems that impressive because they're playing to fears and present misleading information that that's technically correct to plays in their favor. Harvard University's Institute of Politics presented some interesting survey data, that showed unsurprisingly that younger voters polled stronger for electing President Obama. But at the same time, the data showed a disinterest in voting by young voters. This impact on voter turn out as well as the election as a whole is interesting to me, because I question the effectiveness of the tone of the ads, and the debates. But it's easy to complain about the ads, and maybe even the debate tone. But what about the twitterers? Where you tweeting in favor of your guy or criticizing the one who is not your guy? Did you type zingers criticizing the ideas of others? Or did you tweet in a way to encourage collaboration, solving problems, and making America and the world a better place?